BIRANT, C. C. , AKTAS, O. The volume of data produced has exponentially increased with the digital revolution and it continues to race to the limits of the capacity of our computers and supercomputers. Automatic text summarization is one of efforts to tame the bestial product of our daily data production, which have generated the 90 percent of the data ever produced by humans, in the last two years. In order to understand what a text is about, a summary is needed which is short enough not to compromise the understandability, and comprehensive to include the most important topics of that text. Numerous automatic text summarization software which aimed at achieving this goal use semantic relations, thesauri, and word frequency lists. In this paper, development phases and evaluation results of a software tool called Rule Based Turkish Text Summarizer (RB-TTS) are presented. The average success rate of the RB-TTS is analyzed both quantitatively using ROUGE-N metrics and qualitatively. In the qualitative analysis, five summaries, obtained automatically from texts, are evaluated by 10 Ph.D. students from Dokuz Eylul University Department of Linguistics. The summaries generated by RB-TTS software are compared with the summaries, which were written by the authors of the corresponding texts, and marked as close to them. Oflazer K. & Kuruoz, I., "Tagging and morphological disambiguation of Turkish text", Proceedings of the Fourth Conference on Applied Natural LanguaProcessing, October 13-15, Stuttgart, Germany, 1994. Tur G., Hakkani-Tur D. & Oflazer, K., "A statistical information extraction system for Turkish". Natural Language Engineering, 9, pp. 181-210, 2003. Bilgin O., Cetinoglu O. & Oflazer K., "Building a wordnet for Turkish," Romanian Journal of Information Science and Technology, 7 (1-2). pp. 163-172, 2004. Karakaya K. M. & Guvenir H. A., "ARG: A Tool for Automatic Report Generation", Istanbul University - Journal of Electrical & Electronics Engineering, Vol. 4, No. 2, pp. 1101-1109, 2004. Amasyali, M. F. & Diri, B., "Automatic turkish text categorization in terms of author, genre and gender". 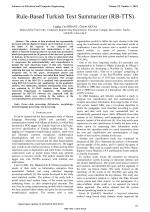 NLDB'06 Proceedings of the 11th international conference on Applications of Natural Language to Information Systems, pp. 221-226, 2006. Ercan, G., "Automated Text Summarization and Keyphrase Extraction". Unpublished MSc thesis, Bilkent University, 2006. Ercan, G. & Cicekli, I., "Using lexical chains for Keyword Extraction". Information Processing and Management, 43, pp. 1705-1714, 2007. Kutlu, M., Cigir, C. & Cicekli, I. "Generic Text Summarization in Turkish". The Computer Journal, 53: 8, pp. 1315-1323, 2010. Ozsoy, M. G., Cicekli, I. & Alpaslan, F. N., "Text summarization of Turkish texts using latent semantic analysis". Proceedings of the 23rd International Conference on Computational Linguistics, COLING'10, pp. 869-876, 2010. Uzun-Per, M., "Developing a Concept Extraction System for Turkish". Unpublished MSc. Thesis, Bogazici University, 2011. Demir, S., Durgar El-Kahlout, I., Unal, E. & Kaya, H., "Turkish Paraphrase Corpus". Proceedings of the Eight International Conference on Language Resources and Evaluation LREC'12. pp. 4087-4091, 2012. Aktas, O. & Cebi, Y., "Rule-Based Sentence Detection Method (RBSDM) for Turkish", International Journal of Language and Linguistics, 1 (1), 1-6, 2013. Hyland, K., "Persuasion and context: The pragmatics of academic metadiscourse". Journal of Pragmatics. 30: 437-455, 1998. Liu, F. & Liu, Y., "Exploring Correlation between ROUGE and Human Evaluation in Meeting Summaries". IEEE Transactions On Audio, Speech, and Language Processing, 2009. Lin C.-Y., "ROUGE: a package for automatic evaluation of summaries". In Moens, M. F. & Szpakowicz, S. (eds. ), Workshop Text Summarization Branches Out (ACL '04), ACL, Barcelona, Spain, pp. 74-81, July 2004. Doran, W. P., Stokes, N., Dunnion, J. & Carthy, J., "Comparing lexical chain-based summarisation approaches using an extrinsic evaluation". In Proceedings of the Global Wordnet Conference (GWC 2004). Birant, C. C., "Root-Suffix seperation of Turkish words". M.Sc. Thesis. Izmir: Dokuz Eylul Universitesi, 2009. 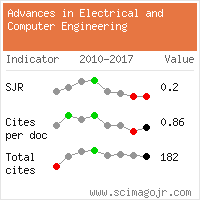 Citations for references updated on 2019-04-21 21:22 in 66 seconds.